As an ever-evolving student on life and relationships, here are a few things I have learned. 1. Invest in the people who invest in you. Choose wisely. 2. Don’t wait to tell people how you feel about them. Tell them now. And if you feel the same tomorrow, tell them tomorrow too. 3. In everything in life, all you have control over is how hard you tried and if you acted with grace and integrity. So take a risk, jump in with two feet, do whatever it takes to fight for what you want – so at the end, you know you tried your best. Conduct yourself with self-respect no matter how challenging the person or situation is – because the one thing nobody can ever take away from you is your dignity. 4. People become what you believe of them. See someone for the best of them, and they will rise up. See someone for the worst of them, and they will fall down to meet that expectation. 5. In love, there is a time to listen to your heart and a time to listen to your head. Be open to love, relish in the risk of it, but don’t be blind to the signs that tell you something is not fitting. 6. Any relationship – whether it be business, friendship, or romantic – that does not have an alignment of values has an inevitable expiry date. 7. Know when to walk away. Know when to stay. 8. Spend more effort trying to get to the root of an issue, versus reacting to the symptoms. You will reach lasting results versus short-term Band-Aid effects. 9. Invalidating someone’s feelings because it’s not something that matters to you is belittling and dehumanizing. Allow people to feel. Encourage people to express. Embrace humaness. The uncomfortable conversations are the ones that build self-awareness and character. 10. If you approach with empathy and an intent to understand versus the need to prove wrong, you will always win. 11. There is someone out there that will find you perfect just the way you are – your imperfections, wounds and quirks included. Work on yourself to be the best version of yourself you can be, keep an open heart and your intentions pure, and you will attract abundance and love. 12. 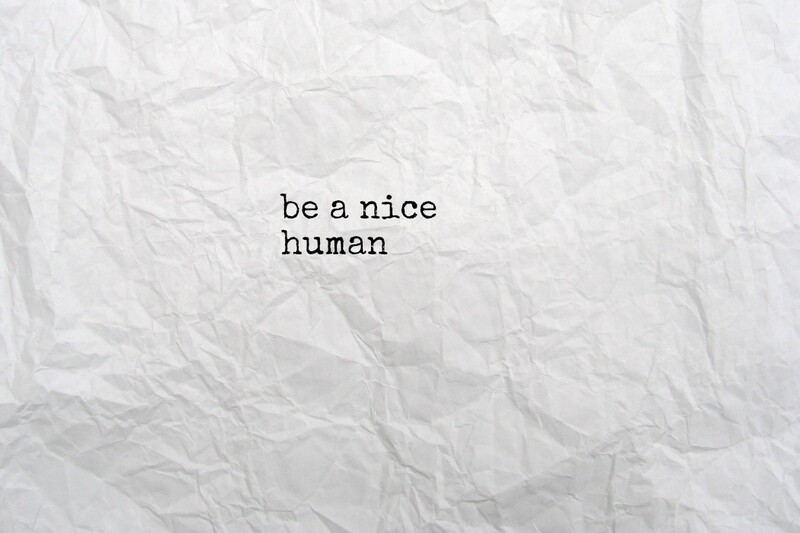 “Be a nice human.” – Unknown. Help, laugh, and don't be affraid. We all are. 13. When someone evokes negative emotions in you – before you assign blame, look inward. People can only trigger something that is already within you. The universe puts people in our path to test us, to trigger us, to give us opportunities to evolve past our old wounds, blockages and insecurities. If you can learn the lesson from these catalysts, you will evolve. Or, you can choose to keep repeating your karma. Be a nice human, indeed.